A short blog post today as it is Wednesday. I have also been travelling a lot and have been reading a lot. And have been otherwise distracted. But I thought this information was worth writing a few paragraphs about for the record. Last week, I wrote a blog post – The fundamental realignment of British society via fiscal austerity (July 30, 2018) – about some of the more unsavoury impacts of the British government’s austerity push. I highlighted how the current growth strategy was precarious because it was reliant on the private domestic sector accumulating increasing debt to maintain consumption growth at a time when the external sector was draining growth, private investment was weak and the government was hell bent on cutting services and infrastructure investment. The ONS data shows that “UK households have seen their outgoings surpass their income for the first time in nearly 30 years” and they “are borrowing more and saving less”. A recipe for disaster. A report published in Australia late last week – 14th Household Financial Comfort Report (August 2018) – provides “in-depth and critical insights into the financial situation of Australians based on a survey of 1,500 households”. It is not a pretty story and demonstrates the global uniformity of the neoliberal approach, which is characterised on ever increasing private debt and falling commitments to sustain public services. The GFC only temporarily interrupted this agenda that aims to reverse decades of gains for workers and their families under social democratic governments. 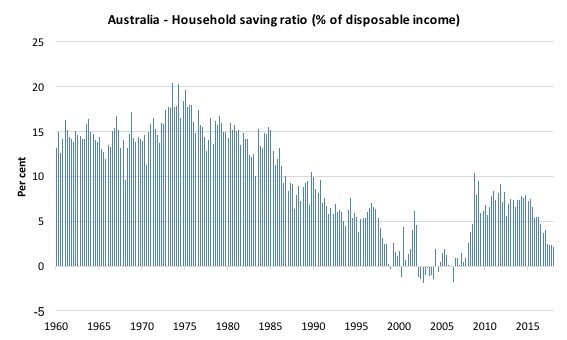 Consider the following graph, which shows the Household saving ratio (as a per cent of disposable income) from the September-quarter 1959 to the March-quarter 2018. The table that follows shows the decade averages. In the March-quarter 2018, the ratio was 2.1 per cent and has been falling since the June-quarter 2015 (when it was 7.5 per cent). The decline in the saving ratio coincided with the squeeze on households from federal government fiscal austerity as the neoliberal ideology became dominant in the 1980s. It was the Hawke-Keating Labor government who pioneered the neoliberal policy shifts and then handed over power to the conservatives who refined the austerity mantra. The Labor government of the 1980s deregulated the financial markets and we saw the rise of the financial engineers (the corrupt banks) pushing credit down the throats of anything that they could find (and dupe) that had a heartbeat. The current Royal Commission into the Financial Services sector is highlighting how corrupt and criminal the big banks and financial companies have been over a long period of time in Australia. By the late 1990s, with the Conservative government recording ever increasing fiscal surpluses, growth was only maintained by the massive private domestic sector credit binge and you can see that the household saving ratio went negative for several quarters. The GFC brought that period to an end but is hasn’t taken long for the banks to regroup and renew the credit push as government support for growth has waned as a result of the austerity obsession. The narrative is very similar to what has been going on in Britain with some nuances. The – Household Financial Comfort Report (HFCR) – cited above, provides some finely grained evidence of these trends. Currently, around a quarter of Australian households have less than $1000 in cash savings. The Report produced this graph for the Household Comfort Index over the survey’s 14 editions (starting in 2011). It shows “changes in the Household Financial Comfort Index” where the scores are out of 10. But the aggregate result hides the underlying distributional aspects. … overall comfort is getting worse for households with low levels of comfort, but is largely unchanged for households with medium and high levels of comfort. The point is that a growth strategy that relies on households spending more than their disposable income and funding the deficits by running down savings and accumulating increasing levels of debt is unsustainable. This is the consequence of fiscal austerity. It cannot be a sustainable strategy under typical circumstances. Once the tipping point is reached and households run out of savings and start defaulting on debt, then its gets very ugly. Australia is moving in that direction as are a number of countries. I dug this old album out today – Moondog – which was the fifth album by the eccentric New York composer Louis Thomas Hardin, aka Moondog. It is an inspiritation especially when you understand his history. It is his interpretation of the music of the streets where he spent a lot of his time. It was released in 1969 by CBS Records and is considered to represent avante garde minimalism – a type of music I listen to a lot. His music is regularly sampled by ‘chill’ musicians. One of several beautiful tracks on one of my favourite albums. The baritone saxophone parts are killers. What makes matters worse is the banks are tightening their lending criteria substantially as part of the fallout of the royal commission. So when someone on the edge tries to rewrite their loan or mortgage to lower their repayments, they can’t. We’re at that tipping point, I believe. Matt, bankers will simply re-write their rules, so that the credit fest’ does not get interrupted. Only voters themselves can peacefully bring about an end to this rampant neo-liberalism and cease voting for neo-liberal croney politics. Sadly “most” voters have been duped into thinking the alternatives are worse and so think the neo-liberal option is the least worst option. It seems not even the ever present threat of recession or depression (arising from deflation – that word which must not be mentioned,) forces them to reflect and change their mind. It’s as if they no longer have minds, well not ones that can be changed. That is what is so dangerous. They have become like cattle, available to be slaughtered, on the alter of wealth accumulation by the 1%, cheered on by their crony politicians. Only the 1% and their Central Bankers have come to matter. Another (non-economist) MMTer and myself try and lob the odd incendiary into Kouk’s Twitter feed, but the returns are small, mostly non-existent. The lack of progressive narrative on this is the looming stumbling block. Bad enough that Labor, (and Greens despite Steven Hail’s recent efforts), won’t face this in Opposition, but soon enough, presumably, they’ll be ‘in’, and actually scratching their heads how to sell, and then implement, ‘fair austerity’. The government has been forced to give more money to ASIC, and the regulator is going to embed staff in the big 4 banks. They won’t put the big banks out of business but they sure as hell will be happy to penalise and prosecute individual directors. Everyone drives the speed limit when a police car is behind them, so to speak. Great idea to embed the enforcers but human nature means they will be “captured” eventually. Best to have an incentive plan of some kind like the US whistleblower reward system. $21 milion has been paid out on occasion. That should solve Federal budget limitations. A percentage of the wrongs uncovered to fund the individual and the Agency.